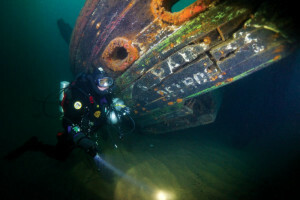 Technical Diver Erik Foreman locates the Parker’s stern showing the “A.A. Parker, Detroit,” painted across the back. Photo by Capt. Jitka Hanakova. “On the second dive, I was exploring around the stern and I looked up, right there, was the name A.A. Parker, all nicely painted. 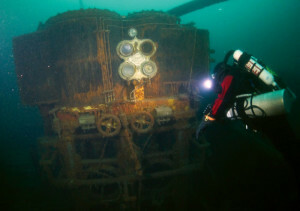 At that moment you know for sure what wreck you’re on.” Said Techincal Diver Erik Foreman. 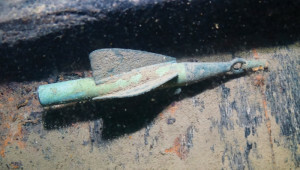 The Great Lakes Historical Shipwreck Society discovered the location the A.A.Parker in 2001 with their research vessel R.V. David Boyd. 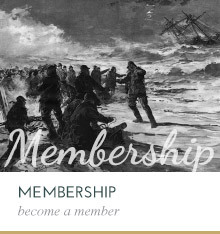 This summer the Shipwreck Society is making great strides to complete surveying this historical shipwreck site. The GLSHS Dive Team has focused their resources to further photograph, video and side scan the Parker. Shipwreck Society and Dive Team Members Capt. Jitka Hanakova, Capt. 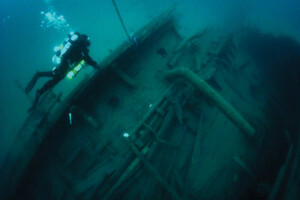 Dave Sutton and Erik Foreman have made several dives on the shipwreck documenting the site. Darryl Ertel is the GLSHS Director of Marine Operations. Using this new data, he’ll oversee the creation of a site plan (drawing) and document the numerous visible artifacts. Eventually the wreck site will be open for visiting divers to explore, and Ertel anticipates keeping the site plan updated when new artifacts are discovered. The site is really amazing, since the vessel is “broken open” on the bottom. You can see the entire steam engine with out “penetrating” an inside, overhead environment. “It’s a different world down there, its like being an astronaut in space, you feel weightless and you get to see something that not may people see, a piece of history that’s been sitting there for hundreds of years. It’s challenging, fun and intriguing for me.” Said Hanakova. And as all divers know, removing artifacts from a shipwreck site is illegal in Michigan. Take nothing but pictures and leave nothing but bubbles. In 1890, the Kasota collided with the steamer City of Cleveland in the Detroit River with the loss of one life. A year later, the Kasota was raised and completely rebuilt. Renamed the A.A. Parker in 1892, she was 249 feet long, 38 feet wide and had a gross tonnage of 1660. The propeller driven wooden steamer was an efficient freight hauler. On September 19, 1903 the Parker foundered four miles north of Grand Marais, Michigan in Lake Superior. The stout little vessel was carrying a load of iron ore from Wisconsin when she ran into a fierce southwest gale. The ship started to split her caulking and leak. The pumps could not keep up with the deluge of water flooding into her hold. 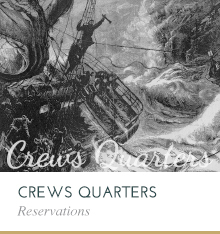 Captain White turned his vessel towards Grand Marais, blowing her steam whistle in distress. The U.S. Life-Saving Service look out at Grand Marias spotted the Parker in grave conditions. Captain Trudell ordered the deployment of the Life-Saving Station’s surfboat. The surfboat reached the Parker within 50 minutes after a four-mile row. 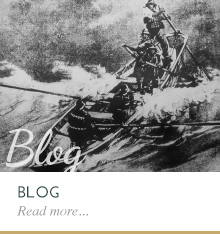 Life-savers took 9 of the men into their surfboat and the remaining 8-crew men launched the Parker’s yawl and followed them back to shore. After the entire crew and two dogs were safely in the two boats, the Parker shuddered, and slipped bow first into the depths. The crews of both boats pulled on their oars for nearly three hours, making very little headway. The southwest gales slowed their progress, and the exhausted men were ready to give up. The tugboat E.M.B.A. came out from Grand Marias and towed the yawl back in. The life-saver’s surfboat was also assisted with a tow by the tug J.W. Westcott. All seventeen crew members of the A.A. Parker were saved, as were one of the officer’s two dogs. Research tells us that dogs were a common site aboard many ships in that era. Today, Hanakova and Sutton’s dog Deco is a valued crewmember and accompanies them on all of their boating excursions. Today, the A.A. Parker shipwreck site is within range of technical divers with mixed gasses. A lot of responsible dive planning and safety are involved exploring this site. “It’s just a wonderfully preserved time capsule of artifacts. It’s going to be a challenge to document it, but it’s a worthy task to do.” Said Sutton. 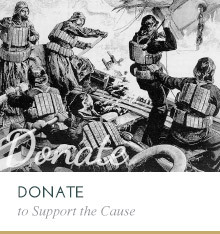 The Great Lakes Shipwreck Historical Society would like to thank Capt. Jitka Hanakova, Capt. Dave Sutton and Technical Diver Erik Foreman for their assistance in surveying the A.A. Parker. The underwater photographs and video provided by them is an invaluable aid in documenting this important historical shipwreck site. GLSHS Dive Team Members waiting dock side for favorable weather conditions at the Grand Marais Harbor, Lake Superior, Michigan. (Left to right) Technical Diver Erik Foreman, Capt. Dave Sutton and Capt. 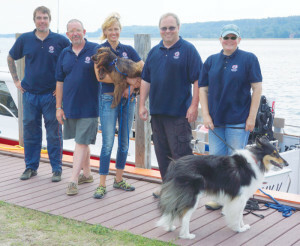 Jitka Hanakova holding their Boykin Spaniel puppy Deco Deep Diver, Director of Marine Operations Darryl Ertel and Sarah Wilde with their tri-color Collie Nikki. Technical Diver Capt. Dave Sutton explores the engine area. The wood boards insulating the steam engine cylinders are still intact, along with the guage panel. These are very unique items to be so well preserved on a shipwreck. Technical Diver Capt. Dave Sutton examines the stern area of the Parker. The large rudder sits at an angle behind the propeller. The roman numerals indicating the vessel’s depth clearance, or draft, is still visible along the stern’s edge. 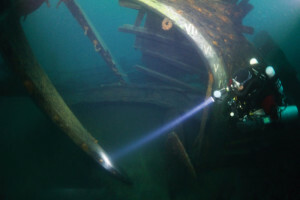 Technical Diver explores the shipwreck site of the A.A. Parker. The ship has broken apart on the lake bottom. 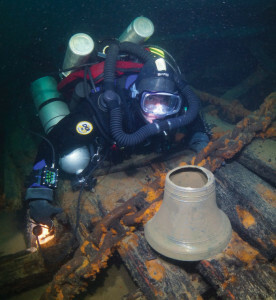 Technical Diver Erik Foreman examines the ship’s bell. The bell has broken from it’s mount and rests on wooden beams next to a length of anchor chain. A unique artifact to find on a shipwreck is a taffrail log. The taffrail log is dragged from the stern of the vessel with a stiff line. The log would spin and be read directly on a dial mounted to the taffrail. The mechanical system could calculate the vessel’s speed and distance through the water. Photo by Capt. Jitka Hanakova.